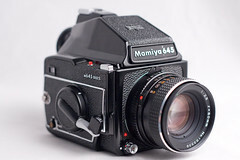 The Mamiya M645 is the first series of 4.5×6 SLRs made by Mamiya. It has an electronic focal plane shutter. The finder and screens are interchangeable, but there is no magazine back, only pre-loadable film inserts. This made it easy to preload onto less expensive film magazines, but no mid-roll change is permitted. Up to 15 frames can be captured onto a 120 roll film. All the M645 models covered here share the same accessories (finders, screens, lenses, grips and inserts). 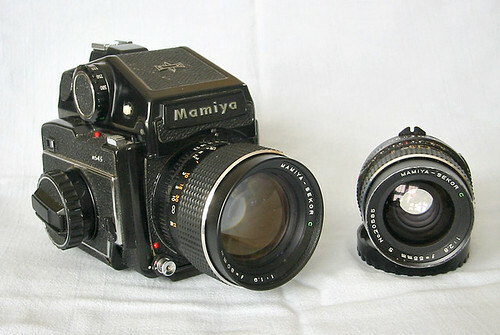 The lenses and inserts (but not the viewfinders) can also be attached on later manual-focus cameras such as the M645 Super. The original M645 appeared in 1975. It has a knob advance with a flip out crank and shutter speeds from 8s to 1/500. It sports a mirror lockup and double exposure lever. There are dedicated flash sync terminals on the body, one for electronic X and the other for bulb FP. Flash sync is 1/60 sec. There are two shutter release buttons on the camera body. Both are useful depending on type of grips and viewfinders used in the system. The first one is on the front below the lens mount. It has a lockable collar and is threaded to accept a cable release. The second is on a small ledge on top of the camera to the right of the viewfinder. The focal-plane shutter itself has cloth blinds, travelling vertically. 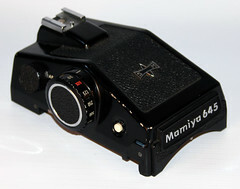 This is electronically controlled, using a mechanism Mamiya patented. The shutter-speed knob is on the left hand side of the body. The speeds marked in green are for full seconds: they include 1, 2, 4 and 8 sec. For slower fractions of a second the speeds are marked in orange: 2, 4, 8, 15 (i.e. one-half to one-fifteenth), and in white, 30, 125, 250, 500 (1/30 to 1/500 second). 60X shutter speed is in red and represents the maximum speed for electronic flash sync. There is also a circle marked in red between B and 500. 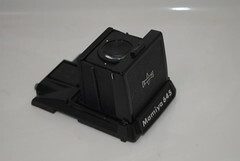 Set to this position to use the shutter speed dial on either of the metered prism finders (there are two, with CdS and photo-diode meters respectively); in either case, the film-speed dial is incorporated in the finder's shutter-speed dial. The camera body has lugs instead of slots for the strap mount. The film back has a memo clip to attach a roll film box top as a reminder of film type. Opening the film door requires pressing on to this memo area, while moving the lever to the right. Loading film onto inserts require aligning the paper leader start mark with an indicator on the insert. There are two inserts available, one for 120 film the other for 220. The number of exposures on the film counter is affected by they type of insert used. The counter is reset when the insert is removed from the film chamber. The M645 takes a 6 volt battery that provides power for the camera body as well as finders. It can be accessed at the base of the camera body by the tripod socket. To use twist the knob on the plate in the direction indicated and it will pop-up. It takes PX28 or 4LR44 type batteries. The location of the battery compartment is not the best. Grips and or tripods plates can block access to the battery. There is also a red battery test button by the top shutter release. By pressing it, a lamp on the shutter knob side will light. The lenses have rings for focus and aperture, along with focus and depth of field scales. There is one switch changeable from A to M by the lens barrel. This changes the lens from automatic to manual for stopping down the lens to the aperture selected for depth of field preview. The lens has a metal yoke at the mount end; the signal pin of the metering prism (if used) must engage with this yoke as the lens is mounted. Its position signals to the meter what aperture is set. There are three lenses with leaf shutters, which also have a shutter speed ring and cable release socket. 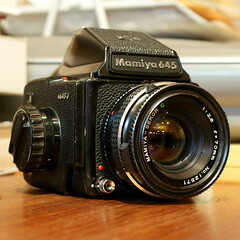 The M645 1000S (1976) adds the 1/1000 top speed, a self-timer, a depth of field preview button other details. The manual advance winder knob with fold out crank is now primary just a crank. It is still removable, so many cameras on the used marketplace might be different or they were lost because some hand grips require them removed. 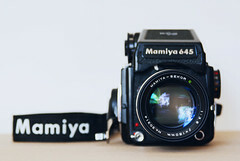 The M645 J (1979) is like the original model with shutter speeds from 1s to 1/500 but with the mirror lockup feature removed. The J is for Junior. It also lacks the upper shutter-release button of the other M645 models. It was only made for export. Focusing helical focusing built into each lens. Lewis, Gordon, ed. The History of the Japanese Camera. Rochester, N.Y.: George Eastman House, International Museum of Photography & Film, 1991. ISBN 0-935398-17-1 (paper), 0-935398-16-3 (hard). P.147. McKeown, James M. and Joan C. McKeown's Price Guide to Antique and Classic Cameras, 12th Edition, 2005-2006. USA, Centennial Photo Service, 2004. ISBN 0-931838-40-1 (hardcover). ISBN 0-931838-41-X (softcover). P.647. Sugiyama, Kōichi (杉山浩一); Naoi, Hiroaki (直井浩明); Bullock, John R. The Collector's Guide to Japanese Cameras. 国産カメラ図鑑 (Kokusan kamera zukan). Tokyo: Asahi Sonorama, 1985. ISBN 4-257-03187-5. Item 2172. This page was last edited on 9 January 2017, at 01:46.